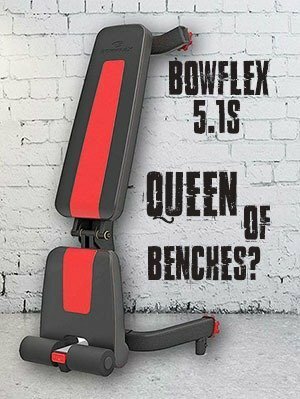 Home gyms are getting more popular each year and with them raise a need for high quality home gym equipment. 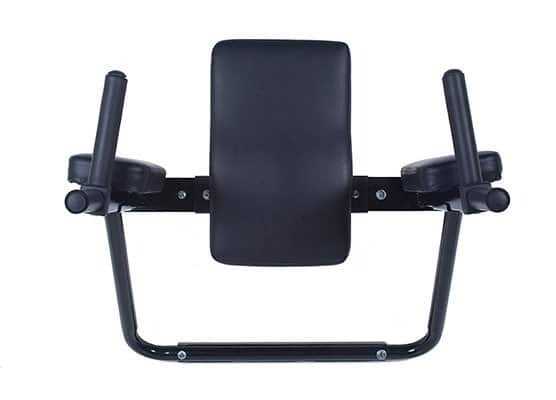 Besides power racks, power towers, exercise bikes and other gym equipment, one of the most desired piece are dip bars, or also known as dipping bars. Why Should I Use Dip Bars? Okay, I get it. So Which are the Best? 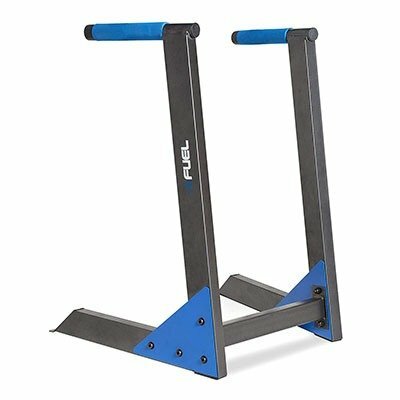 In this comparison review, we (well, just me and my buddy) put together 9 best dip bars on the market that you can use in your home gym. 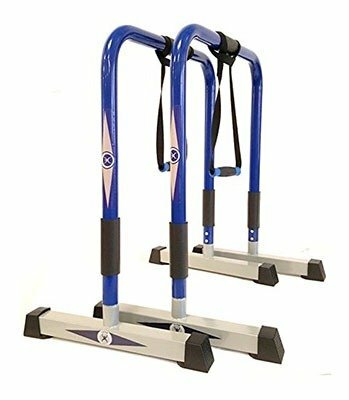 These bars are also portable, so even if you don’t have your own gym, they do not take too much space, so store them in your room. Now that you are about to purchase dip bars, you should also know several of the benefits dipping actually offers. If you are a beginner, doing more and more dips without adding additional weight will be more than enough. In a short period of time (considering you will be dipping at least several times a week), you will realize that you can do not just 5 dips, but 8, then 10, then 14. Your back, shoulders, upper chest and triceps will be stronger, firmer. Once you will be tired of doing endless repetitions, you can use dip belt with chain and add some weight, to make it more challenging. This way, there is basically no limit to what you can achieve on dip bars. Most people think they can strengthen elbow joints only with exercise bands. This is not correct. Dips are a great way of strengthening the joints as well, if done properly. Consult with a professional how to perform dips correctly. CKC is basically a movement in where you move your body, while your hands and/or feet are still (in a fixed position). What this basically means is that it is one of the few exercises where opposing muscle groups in your body are working simultaneously. It is an opposite of standard OKC (Open Kinetic Chain) exercises. If I may be so bold, I don’t think there are one top dip bars that beat all the others. Each of the best dip bars that we will review here have their own pros and cons and it is up to each individual to determine which ones are the best for you. The very first on our list are Dip Bars by Lebert. They are simple, yet sturdy and portable dip bars. Easy to put together, you can have these babies set and ready in less than 10 minutes. The come in two different sizes, standard and XL. The standard is 28.5″ (72.4 cm) of height, while the XL’s height is 31 inches (78.7 cm). Made of stainless steel with foam grips, they can support up to 400 lbs (181.4 kg). The sturdiness of the bars also depends on the floor you are using them on. You need to be very careful when doing calisthenics, as you might tip off. Another one who made it to our list of best dip bars are dip bars made by Ultimate Body Press. These particular dip bars are adjustable with two different width positions, so it is a great choice if you have a bulkier or thinner family member, whom with you want to share the bars. They are exactly 3′ tall (91.44 cm) and can support up to 350 lbs (158.7 kg). The uncommon design of the dips is the result of making two dip bars into one construction – which seems very clever. Despite the one-piece construction, the dip bars can be easily dissembled and stored, so they will take up very little space. 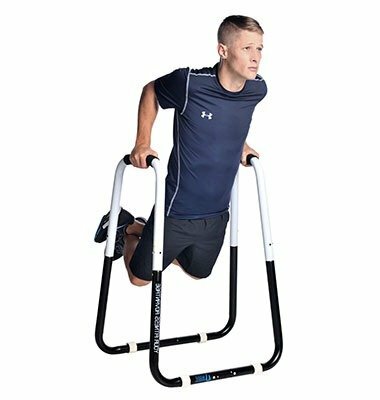 They are perfect for dips and even suspension exercises; however, due to their height of 3 feet, they are rather unstable when doing intermediate calisthenics. Next on our list are dip bars made by XTEK Gym. These bars are quite different from the ones mentioned above, mainly due to their design and purpose. They are made of 2mm thick gauge steel with powder coating for non-slip design. Rounded tubing of 1.25 inch (3.17 cm) offers easy grip. 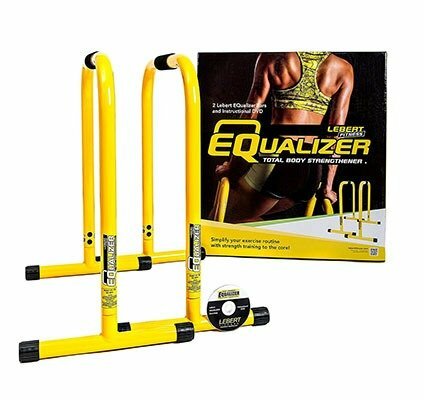 Tall only 14.5″ (36.83 cm) and long 19″ (48.26 cm) they offer great stability for a long range of exercises. According to the manufacturer, the assembly is quite easy and should not take more than 10 minutes. Another Dip Bars that made it to our list are made by ProSource. The bars’ dimensions are 24″ (60.96 cm) wide and 31″ (78.74 cm) high. The bars are individually adjustable up to 35″ (88.9 cm) height. The individual adjustment is great n case of several exercises that work with two different bar heights. The bar tubes are made of iron and powder-coated. They can support up to 400 lbs (181.43 kg). Extended rubber feet will prevent slipping on all kinds of different floors. The one important thing that separates ProSource dip bars from competition is the stabilizing safety connector that connects the two bars from 16 ¼” (41.27 cm) and can be extended to 23 ¼” (59.05 cm). This beauty by Fuel Pureformance made it to our list as well. This particular dip station works as one piece when assembled. This is more of a dip station on its own, rather than dip bars, although since it does not have any other bars, I’ve decided to include it in the list. This is also a very good tricep dip machine. The station is easy to assemble; you should be done in under 30 minutes. The entire construction is made of steel with powder-coated finish. The dip bars are angled outwards toward the user, which offers better performance. The top handles are 16 ¾” (42.54 cm) apart on the far/back end and 20 ½” (52.07 cm) apart. The grips are padded, as with most dip bars here. 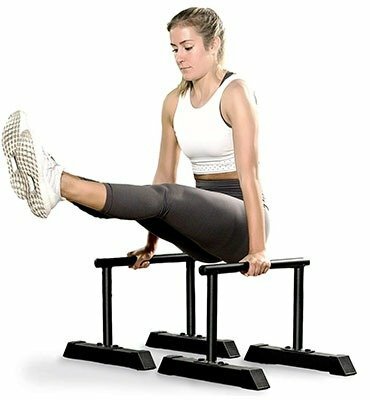 Parallettes Dip Bars by Gravity Fitness are specially designed to be used for all kinds of exercises, including but not limited to CrossFit, Calisthenics and body weight exercises. Dimensions of the product are 23 ½” (60cm) length x 31 ½” (80cm) height x 17 ¾” (45cm) width. 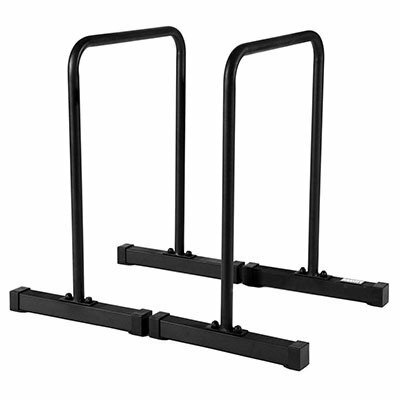 The bars are made of steel with powder-coated in matte black. The 2″ x 2″ (5 x 5cm) box section feet makes the bars very stable on all kinds of floors. The only wall-mounted dip bars on this list, dip station by Ultimate Body Press is one of the best out there. It deserved a spot on our list, mainly because it is especially designed for home installation. The dip station is made of heavy-duty steel, with powder-coated finish in gun-metal grey color. Comes with padded foam grips and cushioned back and arm rests for maximum comfort and performance. Depending on your preferred style, you can melt your triceps on this particular dip station. The dimensions of the product are 26″ (66 cm) height and 28″ (71.12 cm) width at the widest point. The distance from the wall to the edge of the bars is 26.5″ (67.30 cm). Dip station by CoreX also made it to our list because of the positive feedback among the users. The bars are made of tough steel with powder coating. The feet-parts are contoured for sideward ground placement, thus increasing stability. 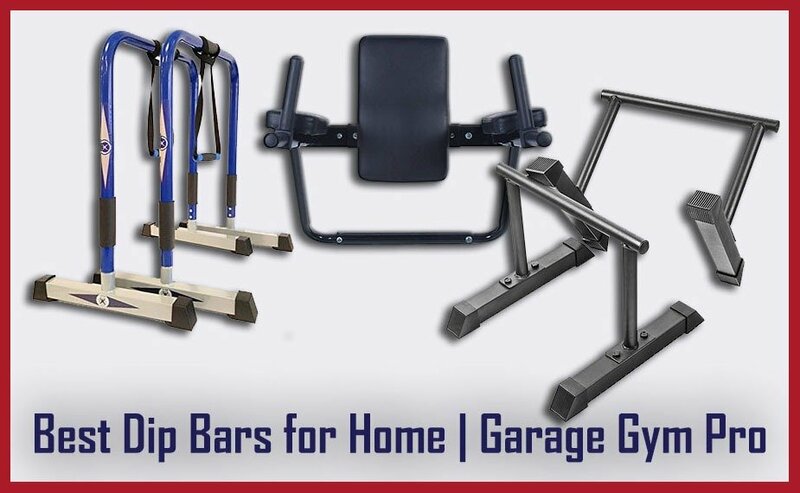 Unlike most of the competition, these bars offer three padded handles, one on each side for various push-up exercises and one atop in the middle for dips and other exercises. 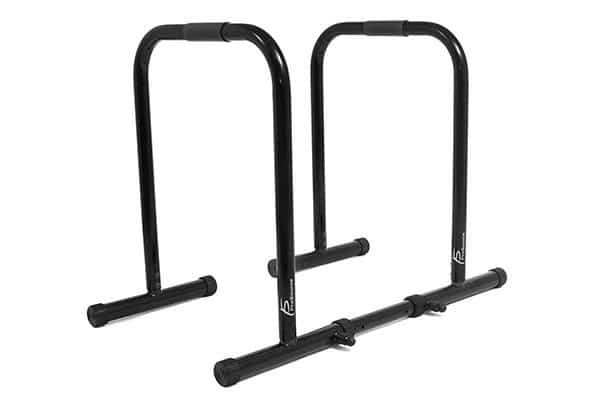 Additional these bars come with two removable CoreX handles which can be looped over the main middle bar, which offers various suspension exercises. The bar supports weight up to 450 lbs and the assembled dimensions are Height 34″ (86.36cm), bar length 27.5″ (69.85cm) and base width (feet) 21″ (53.34cm). Base square tube: 2X2 inches (5x5cm). There we have it. Those are the 8 best dip bars for home use on the market (at least according to us). As you can see, not all dip bars or dip stations are the same. Some are two separate bars, some are made for calisthenics, while other are extremely stable. I hope that we’ve been able to narrow down your research for the dip station that will suits all your needs.